Flasks There are 23 products. Filter Flask Glass W/Side Tube. 250mL. The heavy duty glass filtering flask is great for performing vacuum filtration via its sidearm tube. Image may vary. 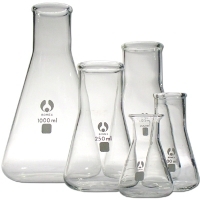 Filter Flask Glass W/Side Tube 500mL. This flask is conical in nature and made from borosilicate glass. The sturdy design features a beaded rim, graduations (mL and %) and a matte white marking spot for easy identification. Image may vary. 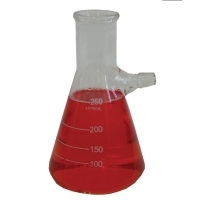 This flask is conical in nature and made from borosilicate glass. The sturdy design features a beaded rim, and a matte white marking spot for easy identification. Image may vary.